Banners for the exhibition adorn the entrance of the venerable museum. 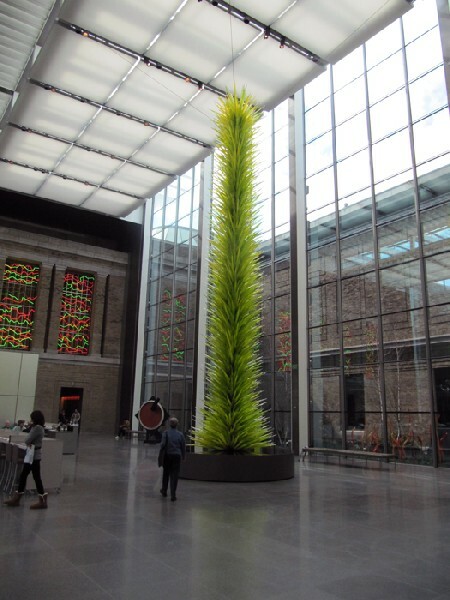 A soaring glass sculpture accents the atrium. The Globe critic, Sebastian Smee, suggests it become a permanent fixture in the atrium. 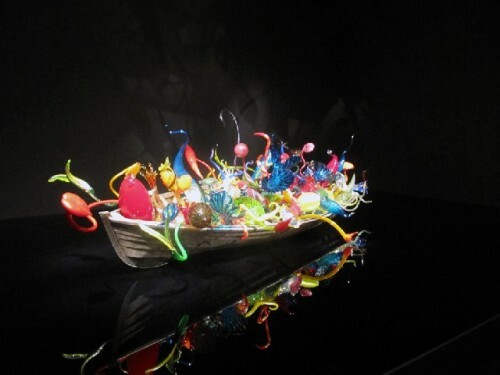 A glass filled barge crosses the Styx of glitz. Explosion of color and light. Vertical ribbons soaring from giant birch logs. Strange creatures of the night. 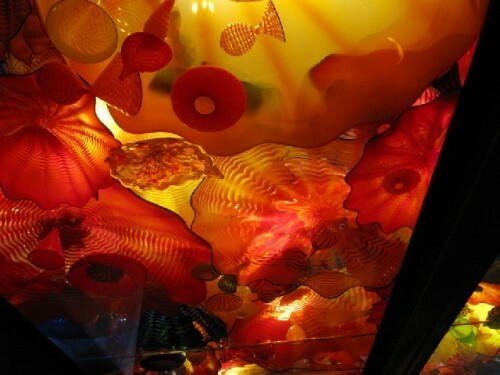 With the special exhibition by glass sculptor Dale Chihuly “Through the Looking Glass” (April 10 to August 7) the casino bling and blang encountered at Bellagio is now on view at the venerable Museum of Fine Arts, Boston. It seems that MFA director and three ring circus master, Malcolm Rogers, has done it again. The populist/ vulgarian who previously presented cars and guitars this time brings Vegas to the Fenway. Really Malcolm, how could you. What happens in Vegas stays in Vegas. There is no gamble, however, in this sure bet blockbuster serving dazzling eye candy to the awed masses. While bantering about defining the term “taste” even the Boston Globe critic, Sebastian Smee, appears to have been blown away. 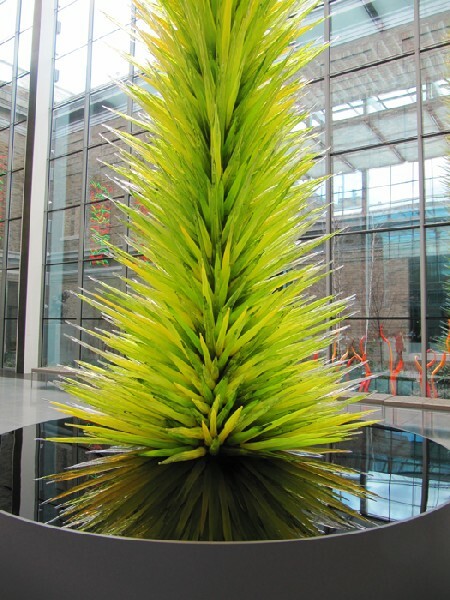 “Called “Lime Green Icicle Tower,’’ it’s a bristling 42-foot column sprouting quills of glass. It looks so good it’s hard to imagine that Malcolm Rogers, the MFA’s director, will not find a way to keep it there long-term” Smee gushes describing a tower of Babel that reaches into the stratosphere of Lord Norman Foster’s otherwise enormously bland atrium. 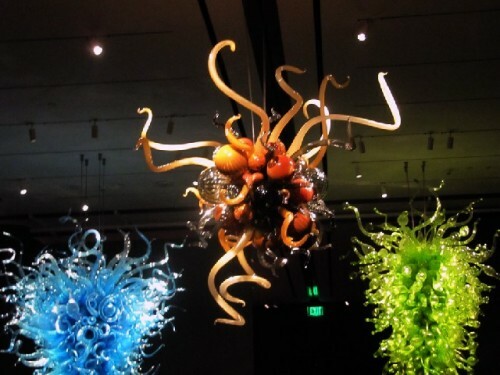 What’s not to like about one spectacular gallery after another filled chock a block with Chihuly’s squiggles and swirls of monumentally scaled blown glass? Or, as Smee argues, it’s a matter of taste. Or the lack thereof. Stating that more or less pigeon holes me as an elitist, high brow, snob. Don’t get me wrong. 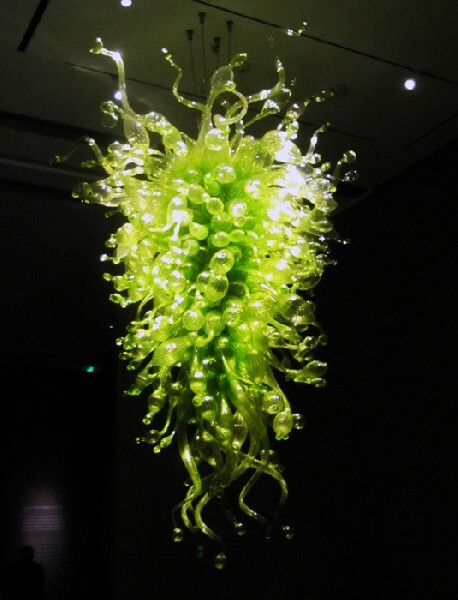 Chihuly is the absolute master of his medium. 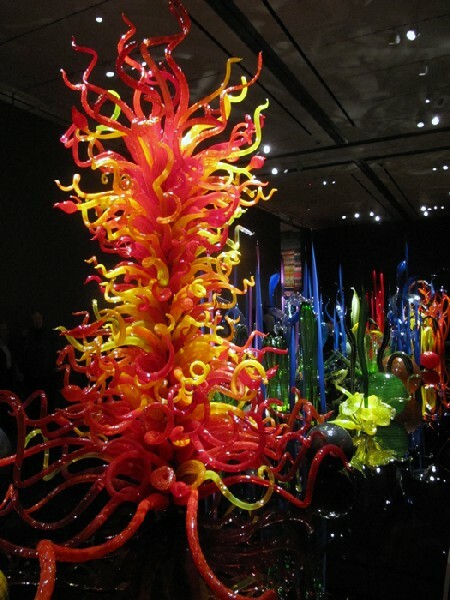 He has completely redefined and updated the ancient technique of blown glass. 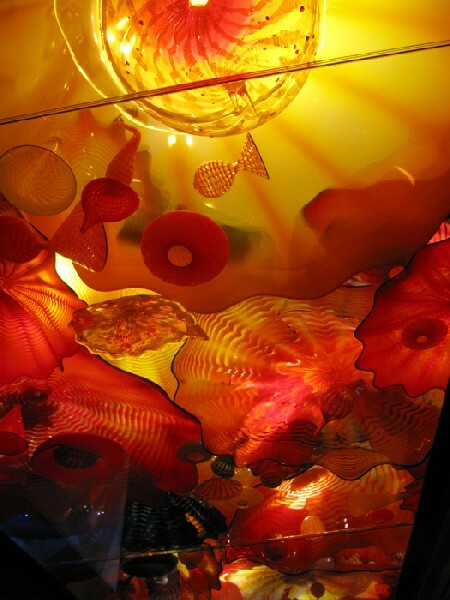 Under his artistic vision glass has expanded from precious, fragile object to enormous, zany, ersatz organic sculptures and installations. 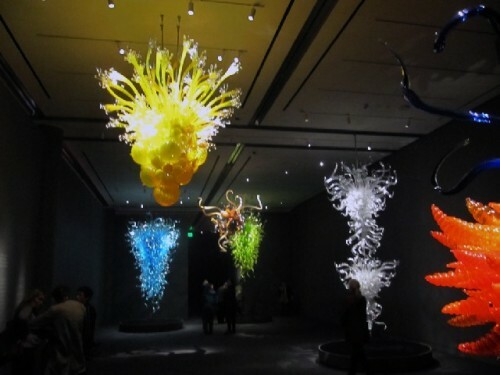 Walking through the exhibition evokes endless, wowie kee flowie, gosh, whiz, bang, shabaam, gonzo, titubating responses. 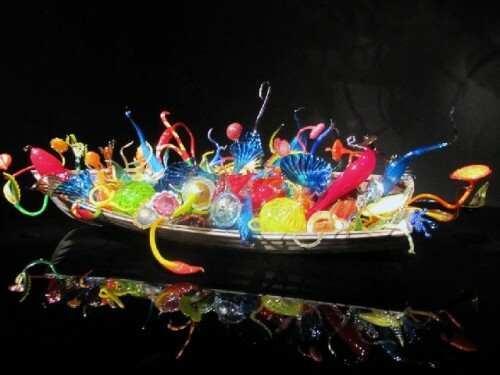 There’s a long boat full of baubles updating Gericault’s Raft of the Medusa. 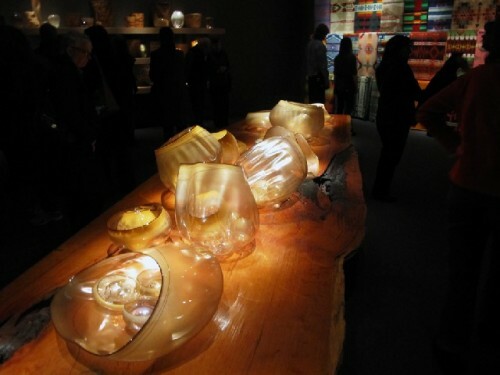 A forest of vertical forms floating up from a stack of enormous birch logs. 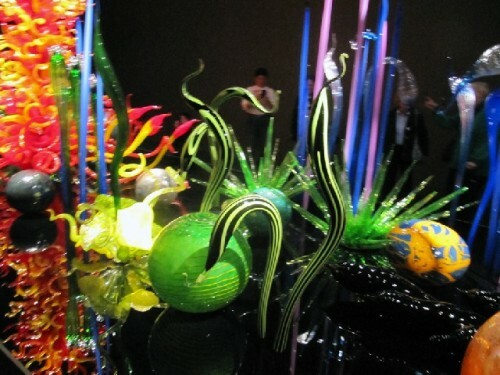 A virtual world of undersea creatures shimmering about. Or overhead a glass ceiling. A Yellow Brick Road leading straight to the gift shop to stock up on chatchkies. 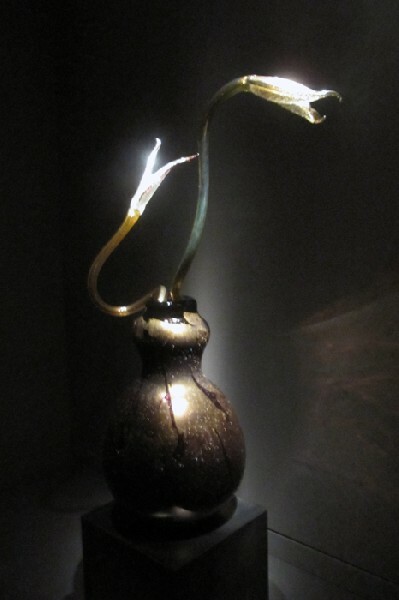 Why does this work which seems perfectly awesome in a Vegas casino feel so dead wrong in a world class art museum? Just like Ralph Lauren’s cars, guitars, Walace & Gromit cartoons, and exhibitions of commercial portrait and fashion photographers Herb Ritts and Yousuf Karsh, Rogers again panders to the public. Isn’t there a law against pandering? Yet again the MFA has lowered the bar to ground level for the masses to waltz over. 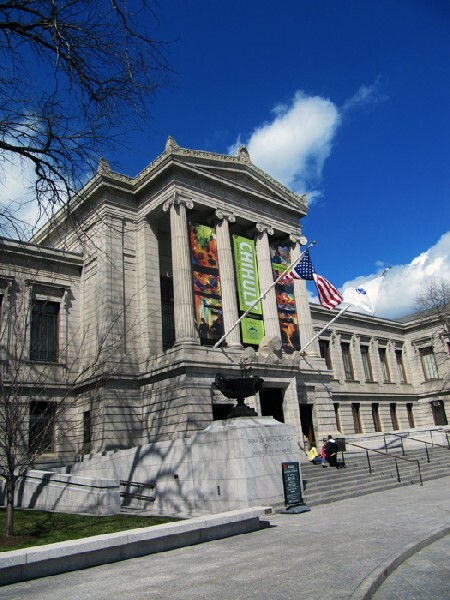 "If the MFA can only survive by pandering to populist ideals, maybe it's time to base its exhibition schedule on Facebook likes or Pinterest pins. Puppy pics and laughing baby videos, after all, have the power to transcend brow levels." 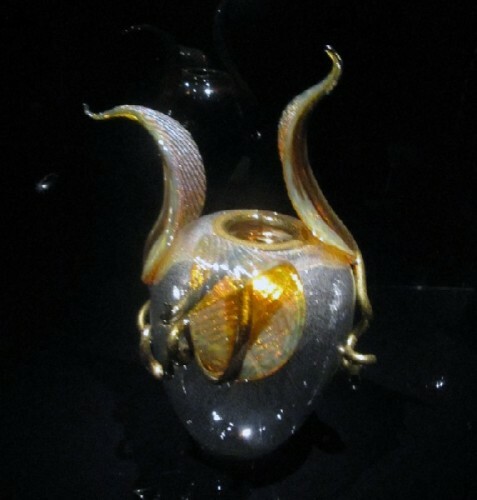 "Decorative Chiluly's work is decorative and eye candy. Some is much better than others. I applaud Charles for telling it like he sees it. 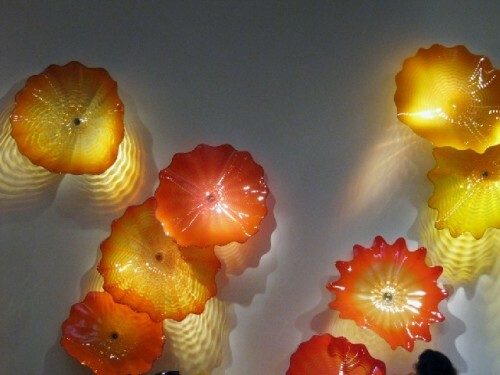 In the age of art entrepreneurs, Chiluly is one of the most successful practitioners. 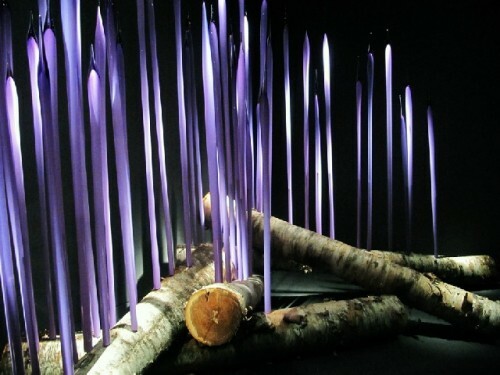 His work is orchestrated like architecture and large expensive jewelry." 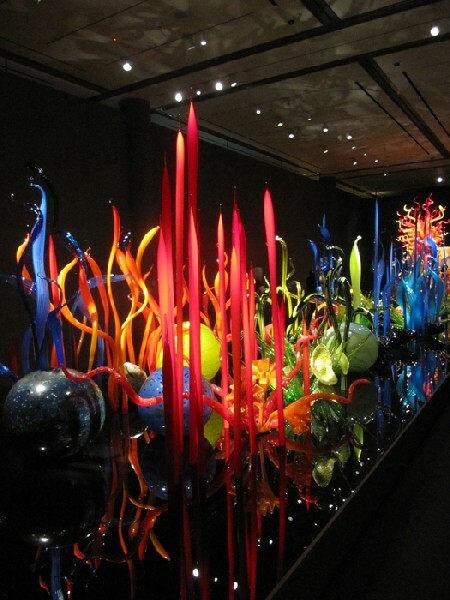 "charles, i gave up dumping on chihuly for being a vulgarian a long time ago. i'm a vulgarian, too, some of the time, and i'm an elitist some of the time as well. 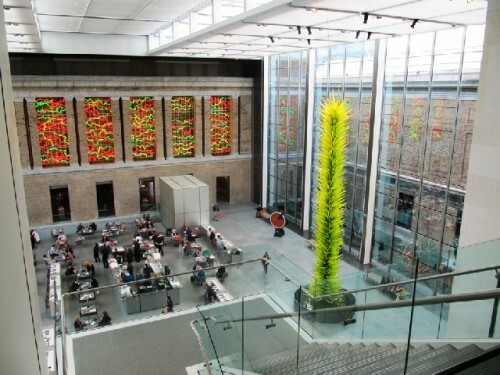 (what i really hate is the stuff in between, much of which fills our museums.) 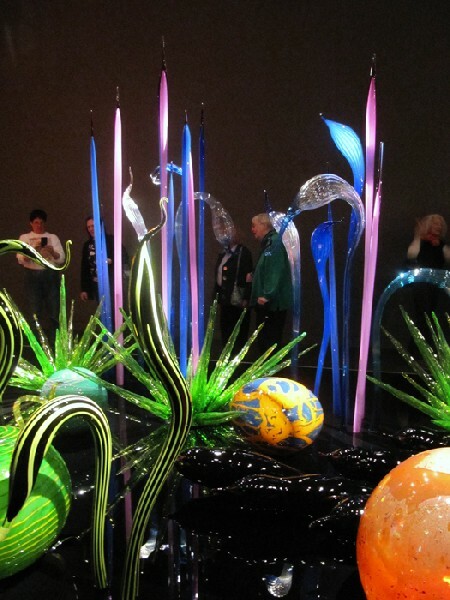 chihuly deals with spectacle about as well as anyone. get over it. before it was so apparent to everyone, guy debord wrote that we live in a society of the spectacle. 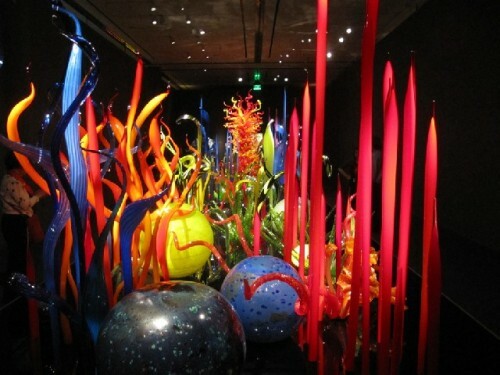 chihuly is one of the master purveyors of spectacular art. and he makes it beautiful. i say hats off to the man. the taste of the common man is not to be so cavalierly dismissed. 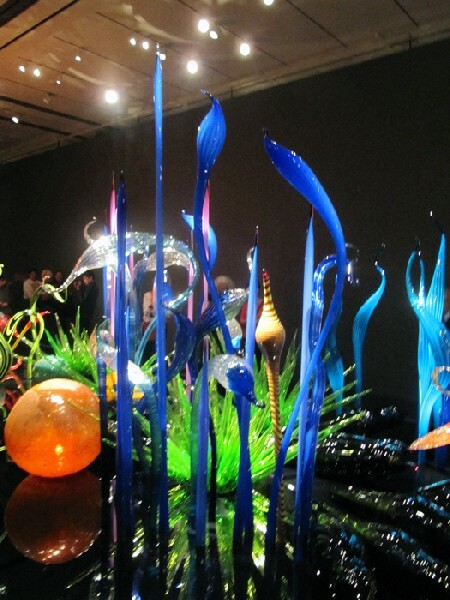 he loves monet, van gogh and picasso as well." 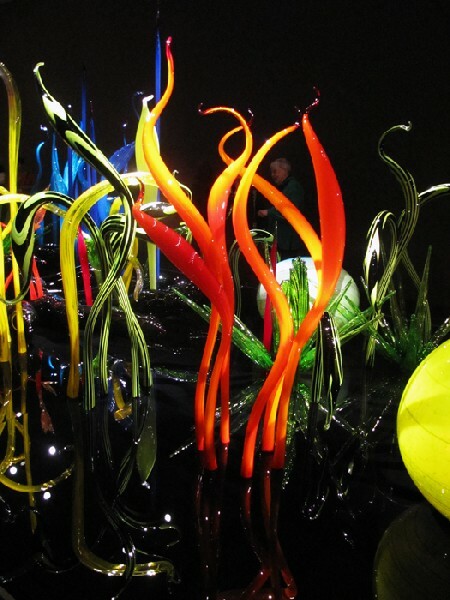 "Am reading your latest opus out here in Arizona and wanted to let you know that I walked through the Desert Botanical Gardens out here in PHoenix last year when Chihuly's work was the come-on, and although it was pretty amazing, I preferred the live desert flora. 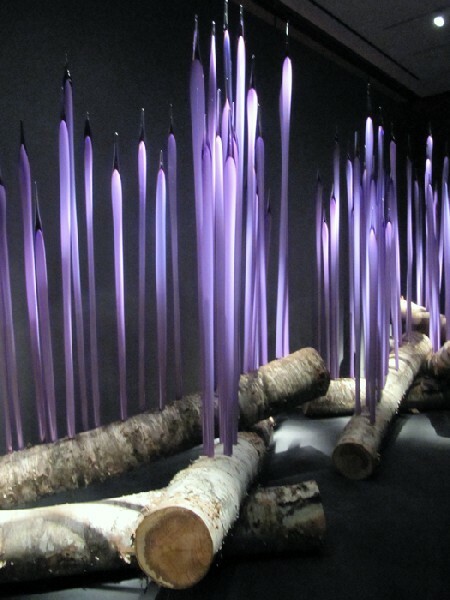 However, I'm sure the Botanical Gardens made a bundle on the exhibit! (In other words, I agree with your review.) Peace and greetings to you and Astrid. And thanks for keeping me on your mailing list. " 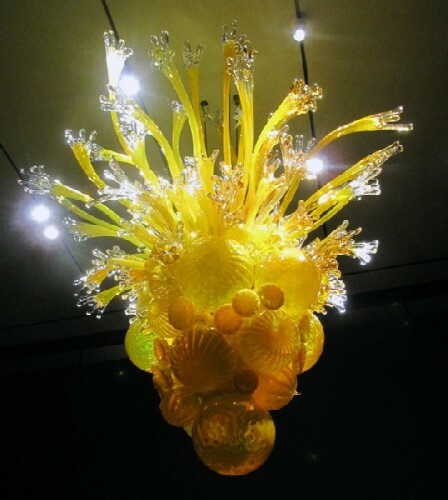 "Absolute luke-warm from Chihuly, the Vegas Glass "pimp' : his ceilings of torqued bowls made sense installed in a casino in island ofNassau, a ho-hum version installed at MFA was hard to do"
"Well, Charles, you sure don't leave any room for doubt. Problem is if the MFA didn't have shows like this exactly how many visitors do you think it would get? I wonder if in this age of ringmasters like Murakami we can argue for the highbrow-lowbrow split."